I want to make use of the currently available Fein Edition 2017 Versions (coming in T-Loc Systainer for Tool + Accessories) to finally get me a Multitool. I occasionally had use for one, but avoided the use when possible, due to the fact that mine was a very low-cost version which lacked power and ability. Now, since I am trying to get my tool collection up and running for anything I might encounter, I want to add a "proper" version. I want it to be cordless, to enable quick use everywhere and have the "quick cut anywhere" tool. Hence the vecturo is out. I am settled on Fein, for the vibration damping and T-Loc etc. The only question is, what to get!? Both would be coming in Systainers, both would have a base of blades and sanding pads. In comparison the Supercut would be roughly 60-70 Euros more expensive (if I calculate the cheapest online pricing for the additional blades/acc & battery capacity). Do any of you have recommendations on the real-world difference between the two units? I recon this will last me for the next decade, with my limited use. I bought the supercut when it came in a systainer from Tool nut. Mine is corded . 400 Watts . I wish I had done it before. I have had it about 4 years and it is a “game changer “ tool. Btw I no longer use the systainer because it takes up to much space. I leave a blade in it and wrap the cord. Works for me. Did you have a different Multitool before you got the supercut? Which one? Which blades do you use? Any experience with carbide tipped for cutting screws etc? Buiding site use here so I would never buy a milticutter that has a cord, personally I feel Festool totally missed the mark with the Vectro. I'd likely go for the Supercut as the depth stop will make blades last longer. One thing I also like about the SuperCut is, that the speed dial is located to the left (top view) not on top of the tool. Seems like a better place to avoid accidental changes. Any more inputs from you guys? As far as I'm aware Feins new Supercut is cordless and Festoool is corded. As far as my needs go that makes Festools version a bit of a fail. Other peoples needs may well be different. I've used the regular Multimaster for years. I bought a Supercut when Toolnut sold them in a systainer for crazy price, and it came with an adapter that allowed me to use the regular blades. Toolnut did the same thing with the 18V Supercut so I had to buy it as I had also been suckered into the 18v Fein drill...Toolnut is incredibly tough on my bank account. I still use all three, the two corded models reside in two separate shops and the cordless lives in my van. I also bought the Festool Vecturo attachments as they fit the Feins perfectly. I don’t disagree, but the Festool one is ancient (2014 or earlier), that’s why I thought the comparison lacks equality. And this is obviously the reason I am looking at the Feins! Can you please elaborate on the “performance differences” between the different Versions? Which Multimaster do you have? 350W? How would you describe the difference to the SuperCut? ..especially for the cordless Versions..
My original Multimaster is at least nine years old and I worked it hard and had all available attachments. The two Supercuts are not the current version with the new blade attaching mechanism. I really find no difference in performance. I have cut steel, aluminum, wood and plastics with both. The cordless one lives in my van is the bomb if working up on a ladder. I also have the dust extractor attachment that picks up 90% of dust when I am cutting drywall. I have taken the plunge. I made my girlfriend listen to the pros and cons, and the darling she is, the reply I got was: "You know, you are going to regret going with the less powerful, down the line..." She knows me well and is the best! What made me go for it was in main parts the thoughts that the brushless motor will be nicer, and that I will value the 200 grams less weight when handling the tool. I will surely get a small 2.5amp 18V battery sometime soon to make it light and nice. Can't wait for the orange systainers to arrive! Does anyone have recommendations from the vast field of accessories? What are the "surprising" tools you did stumble upon? I didn’t own one,but had used a Makita and a Milwaukee and wasn’t very impressed . The multi master is great also. I use the MM blades with a adaptor ,or blades from Bosch . Screws are real hard on any blade,but the carbide ones will cut them,the cut nails a lot easier . You will only get about 5-10 cuts though before the blade gives up. Good call on the cordless one,I see one in my future as well. Just a side note on the oscillating tools, I have three Feins but also have a Milwaukee 12v whose sole purpose in life is to cut off the polycarbonate shims I use. Small and light enough to slide into a toolbelt, great working off an eight foot laddder. After I saw this Russian review from Sergey Shevelyov, where he shows the SuperCut AFSC 18 QSL running off of 18V, 14V and 12V Fein Batteries, I thought that will be my option for a “light” 12V tool, if I need one. The Multitalent (12V Fein) is stated as 1.4kg for the old version and 1.5kg for the new. The Milwaukee 12V mentioned by @rst is an astonishing 0.95kg (the 0.75kg/1.67lbs from their website seems to be without battery). Now I've never measured this but I suspect that the lighter batteries on them isn't always a good thing. I'm guessing that heavier equals less vibration but it is just a guess. Thats my justification for using my Hitachi brushless multitool with 5 Ah batteries all the time anyway. I just don't own smaller batteries and I'll not be buying them as I often work a fair distance away from charging points. I agree with the battery comment, the last thing I want is it to run out mid cut because a smaller battery. As in my earlier post,I have a corded supercut that I love, but I’m looking hard at the cordless Fein . That was a big point, why I went for the cordless SuperCut over the Multimaster, to have the 5ah Batteries. I‘ve done the same with the Carvex Jigsaw. But for both Tools I like to have a small battery, as an option for the times where I know I don’t need the grunt and power, but want a light weight tool for a quick cut. When you get it, let me know what you think! ...I might have been blinded by the Orange Systainers, at least a little. Since everything else in my tool stack is organized that way, I am somehow reluctant to think about things in L-Boxes. I got a 110v FEIN Multi Talent the lil baby one & it has done everything i thrown at it over the last few years. Whenever my mates use it who got Bosch, Makita, Dewalt etc they all say the FEIN is much much smoother, quieter & nicer to use & doesn't sound like its going to rattle itself to bits like the other main brands. But as FEIN invented this type of tool its hardly surprising. I will say two of my mates have had Bosch ones though and the blade holding mechanism worn out & fell apart & they was not impressed. 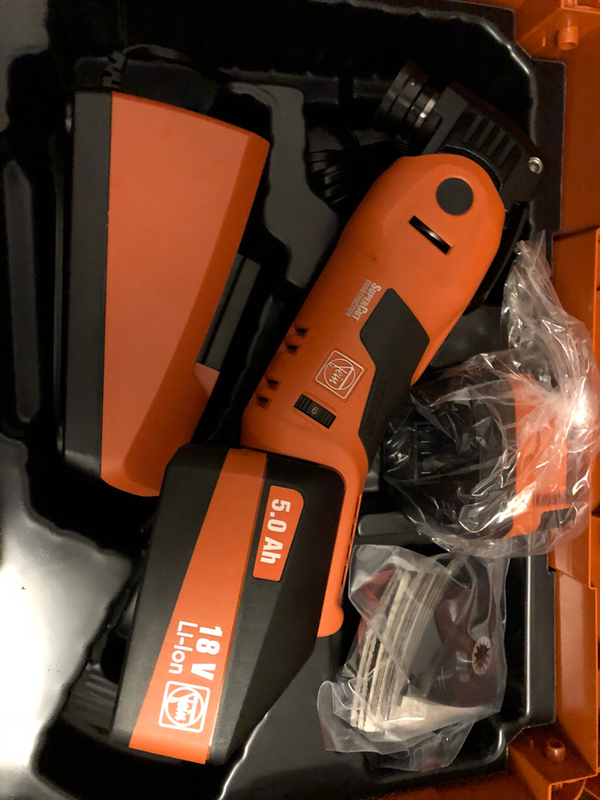 I am looking to upgrade mine to a cordless version later this year & wont be looking at anything other than the FEIN versions, also you never hear any issues about the FEIN batteries either unlike the main brands. I appreciate all brands have their fan boys & favourites but with this particular type of tool i don't think you will find anything better than a FEIN. Do you have a Fein now and if so, which model? I have the Dewalt cordless and it works really well...great feel, like your holding a drill. It has never failed me yet. Looking for a backup because I have been using mine quite regularly lately with my recent reclaimed barn wood projects. I have not had the chance to cut anything today, but it feels good in hand, hefty, but nice and comfortable. My researched weight study seems to check out. Soft start is nice, blades etc. fit easily and the quick release is a huge plus compared to the previous multitools I handled. If anyone has questions, shoot. Any update on your ongoing experience with the 18v Supercut @grobkuschelig ? Someone mentioned there was a dust extraction fitting for cutting, is there one for sanding too? I haven't managed to use it yet so will report back once i have, everything is really good quality apart form the battery charger which feels like it came with a McDonald's Happy Meal, no wall mounting slots on the base of charger & there is no battery lock either & it feels very lightweight. I have had to order a Charger from the US to get a 110v version for UK site use as Fein do not sell a 110v charger in the UK. 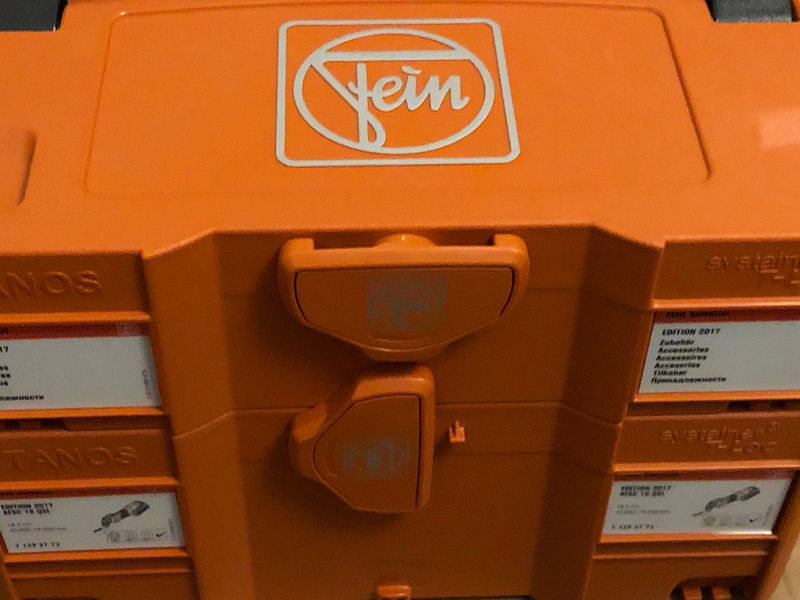 Its really good Fein have started to offer tools in Systainers also but they need to make all tools available in Fein Systainers as they currently have a kludge mix & match of tool cases (3 types i know of) which is just garbage from a premium priced brand such as Fein. I also just purchased their 18v Collated Screwgun but Fein refused to send me out a Fein Systainer for it despite me having just spent around £850 on 2 tools with them, which did annoy me. Oh Just an FYI if you do buy a FEIN product there is an offer currently for additons accessories or tools depending on if you purchased 1, 2 or 3 tools. Have to the say the offers are very decent also.